Italian Chocolate... it doesn't get any simpler than this. Did I say "simpler"; I meant 'sinful'. We were in the neighbourhood for some dinner when we noticed this Italian dessert place. When my friend saw the name, she immediately recognized it as the place she used to visit in Italy. It's the real deal! As soon as you step in, you see the lovely display of various bakery items and also the chocolate tap. That's when you know that this is going to be really good. The interiors feel cozy and at the same time classy. We were spoilt for choice. 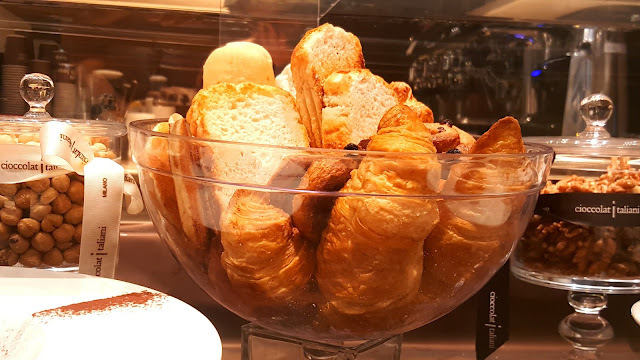 The menu includes waffles, chocolate shots, gelato, crepes, coffees, speciality coffees, various types of hot chocolate (Yes, types), and much more. As you can see, we were spoilt for choice. After much pondering we decided on a few - Tortino caldo al cioccolato, waffle con gelato, and a cappuccino. Noodles, I totally was craving for, and what better than street food. Well, mmm..alomst. At first, when I saw it, I though it doesn't look so classy. Well, duh! Wokyo - this Japanese street food style Noodle bar gives you the real feel as if you're in the streets of Japan. I liked the fact that everything is so Japanese about this place. They greet you in Japanese, and also have things like the green tea flavoured Kit Kat, Japanese Ramune soda, Asahi beer (non-alcoholic), nori seaweed snacks et al for sale. The staff here is friendly; they asked us if it was our first visit there and guided us accordingly. The concept is that you first choose your sauce, then noodles/rice and then your protein. Psst psst...they've got a place for you bag too. A very catchy name, though it was a little misleading for me since I was expecting this cafe to be in Downtown, and not in Karama. 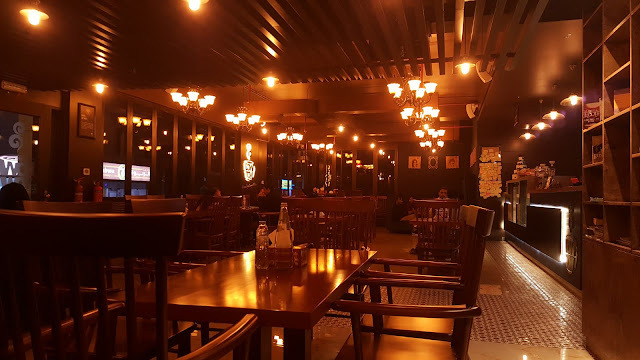 When I read the reviews online and saw the photos, I definitely wanted to check this cafe out. Now there are many seafood restaurants, but this one focuses on particularly Indonesia seafood. 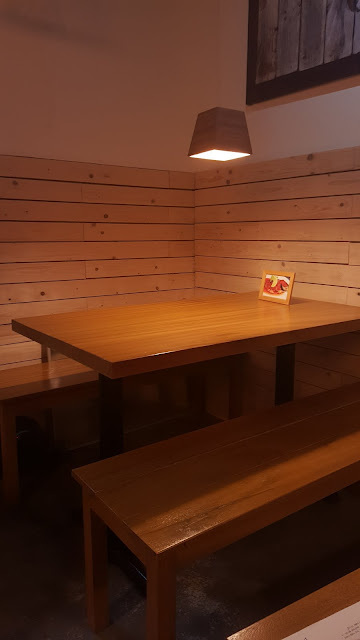 It's a small, cozy place with wooden tables and chairs that give an Asian feel to it. The staff was prompt in attending to us. For starters we ordered the Risol and Tempe Mendoan. While waiting for our food, they gave us some prawn crackers with a spicy sauce!